Gino Mazzuccato’s shop was a tsotchke menagerie, the sort of shop that would have been jammed with cruise tourists earlier in the day. It was evening when I arrived, and I had its shelves of glass animals all to myself, for a few minutes at least. The lone employee said he was about to lock up and make his boat commute from Murano back to the mainland. The islands were too expensive for workers like him to live, he said. I asked where these figurines had been made. Some of the pieces I had seen on the island clearly had been made by local craftsmen who proudly displayed their work. Others were almost certainly made in foreign factories. Their prices were lower and the shopkeepers regarded the merchandise like bottles of Pepsi. “They are made right here,” Bottacin said, and led me into the backroom. Mazzuccato was leaning over his workbench. He blazed a white-hot torch like a laser at a glass rod and spun the molten glass into the shape of a giraffe in seconds. Across the room, a double-doored furnace glowed orange and left me sweating. He put down his creation and introduced himself. He had churned out glass souvenirs like this since he was ten, but age was slowing him down a bit, he confessed. “This is my factory,” Mazzuccato said, touring me through a clutter of equipment. He hoisted a long metal tube, dipped one end into molten glass and blew into the other end. A glass bubble grew, bigger, bigger still, until Mazzuccato shattered it on the floor with a bang. I jumped. Hot glass rained onto my toes through my sandals. He cackled. 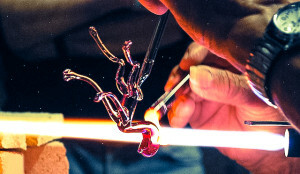 Craftsmen like Mazzuccato were becoming a rarity in Murano. The island is synonymous with the intricate work most people refer to as Venetian glass. Craftsmen here have been making glass for a millennium. 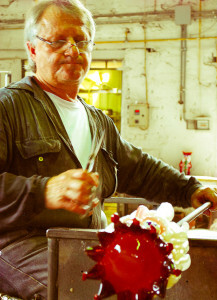 Local glassmakers estimate about half of Murano’s glass now is made in China or elsewhere. The thousands who used to work in the glass industry have dwindled to hundreds. Even the industrial glass factories are shutting down. Ironic words in Venice, I thought. The city practically invented global trade. It was from here that Marco Polo ventured into China in the first place. Maybe he should have just stayed home. Marco Berengo is bent on doing just that. Shoppers won’t find chandeliers or picture frames at his galleries. They’re filled instead with contemporary art, bulbous shapes with bright colors designed by top artists from around the world and created in his glass workshop. “If you go to Venice or Murano, you always see the same things,” Berengo told me. “We thought it was a pity. It doesn’t give dignity to the glass.” Cleaving to old styles preserves the tradition, he said, but it may end up killing it, too. 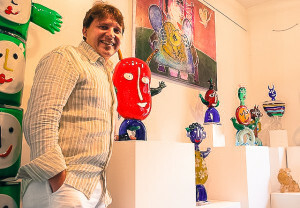 He started Berengo Fine Arts more than twenty years ago with his father, a former English professor with a love for art. 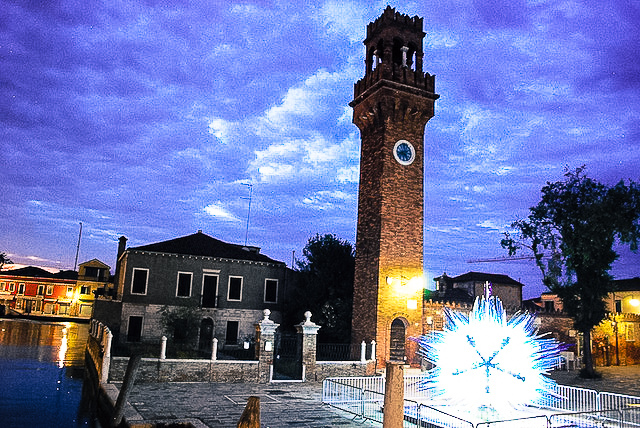 They wondered, could Murano’s craftsmen fuse with the artists of the world to create a new vision of Murano glass? The Berengos hired a maestro, a Murano master who had studied glassmaking since childhood, and began working with top artists who wanted to work in glass. The artists present their ideas. The maestro brings their work to life. Pieces made in Berengo’s furnaces have been shown around the world, even in the Louvre. When we visited, Berengo’s glassmakers were busy with a contemporary take on the Magi. A white-bearded face with a red crown hung off the end of an iron pole. The maestro held it into a glowing oven and shaped it, industrial pliers on delicate glass, centimeter by centimeter. “You’re an artist,” I said. He smiled and shook his head. Not an artist but a craftsman, continuing a tradition first learned from the Romans. “New generations are less willing to toil through Adriatic summer days in front of 2,200-degree ovens,” Berengo said. As the local population dwindles, replaced by retirees and second-home owners, fewer are around to do it anyway. “In the evening now, the streets are empty,” he said. He remembered neighbors laughing into the night on the Venetian street where he grew up. Children played in the alleyway. Old women sat on doorsteps and gossiped. David Frey is at work on a book called Papa’s Planet: An Ernest Exploration of the Places Hemingway Lived and Loved. He lives near Washington, D.C. Read more at www.davidmfrey.com and www.papasplanet.com, or follow @davidmfrey on Twitter. *For another dose of Italian culture check out our piece on Cinque Terre. What a spectacularly beautiful and touching essay. A very gifted writer indeed. Thanks for posting this essay: everything about Venice is shifting with alarming rapidity…commercialization and Billboards are eyesores but seem to be the way people make their living. For the sake of posterity I hope its glass making and lace making traditions don’t suffer. Well written story but sad to read this tradition may be lost. I’ve not yet had the chance to visit Murano. Maybe by the time I do, there will be no glass to write about. Sad.